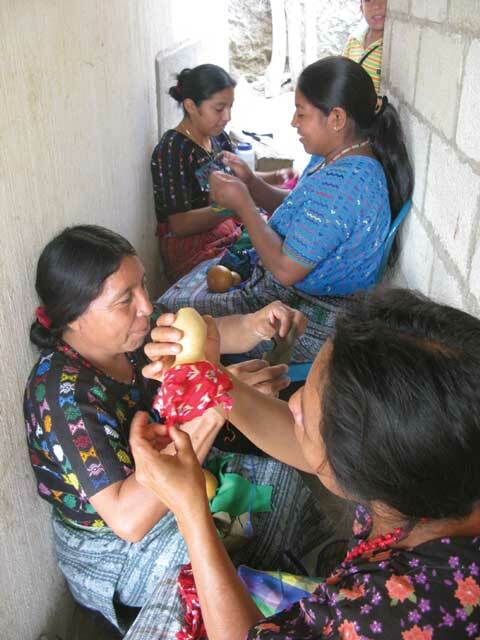 Mayan Hands is a small, fair-trade organization that has been working with Mayan artists since 1989. 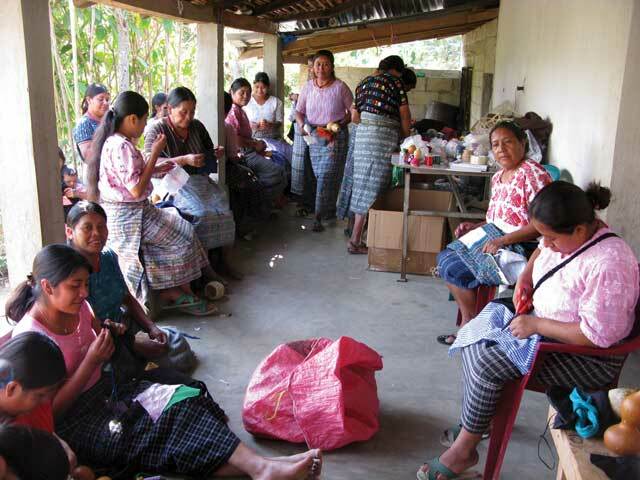 It works with approximately 200 weavers, organized in groups of 12 to 50 women in 11 western and northern Guatemalan highland communities. Its mission is to assist these women by providing the skills and markets necessary to earn a regular income, enabling them to provide for their families and gain control over their lives. 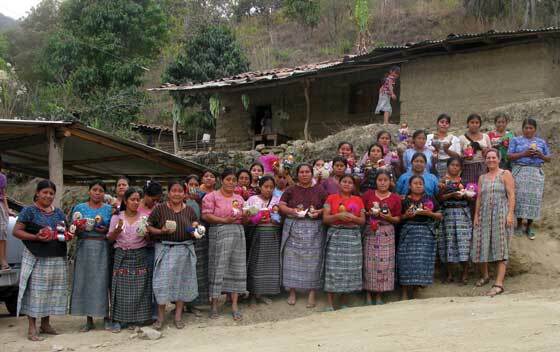 One of these groups is from an aldea of Rabinal, Baja Verapaz. Its members perfected the art of weaving beautiful scarves, but recent low market demand forced them to question their product and try a new idea. The answer, as it turns out, might be with gourds. Rabinal is famous for gourd (jícaras or morros and guacales) art. Gourds (C. alta H.B.K.) grow in the area and are often used as containers and cups. In pre-colonial times gourds were ornately decorated, very highly valued and traded extensively. During colonization the Spaniards even added silver trimmings to the already decorated gourds. Gourds were also associated with many rituals and social gatherings. Traditional gourd patterns often resemble figures found on prehistoric pottery, and are accomplished with red, yellow, black and white paints or engraved. The engraving is done with a crude knife on a cleaned gourd dyed black with lampblack, obtained from the smoke of ocote (pitch pine) mixed with grease. 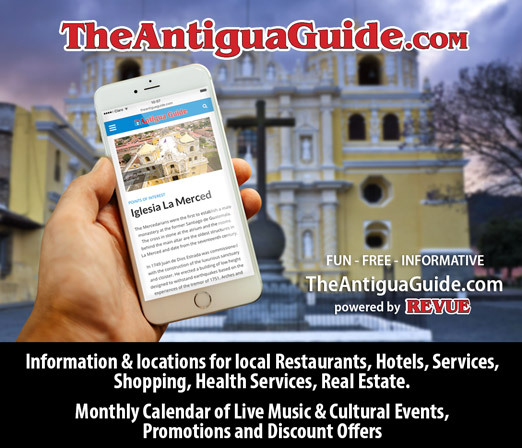 After the design is complete the gourd is polished with a waxy material called nij, which is obtained from an insect (Coccus nige or Coccus axuua) that lives on resinous trees in the region. The wax is extracted from the insects by boiling them and squeezing it out of the body. To thicken and make it soft enough for a good polish, the nij is mixed with linseed oil and lampblack. It is repeatedly rubbed on the gourd with the palm of the hand as more is added to achieve a high gloss. 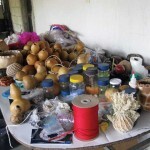 Another common local material is the tecomate or bottle-shaped calabash (Lagenaria siceraria [Molina] Standl), which is turned into instruments or water containers. To clean out the interior, a small hole is cut in the narrow top, and the seeds and pulp removed from the dry fruit. For rattles, small clay pellets and stones are inserted, and then a piece of cornhusk is placed in the hole. For water containers, a dry corncob is placed in the hole to prevent spillage. As it turns out, gourds are common and popular in many worldwide locations, and through Jim Widess (a gourd enthusiast who has written a number of books on the subject), owner of the Caning Shop in Berkeley, California, Mayan Hands contacted me, and I was invited to teach a workshop on making gourd dolls. 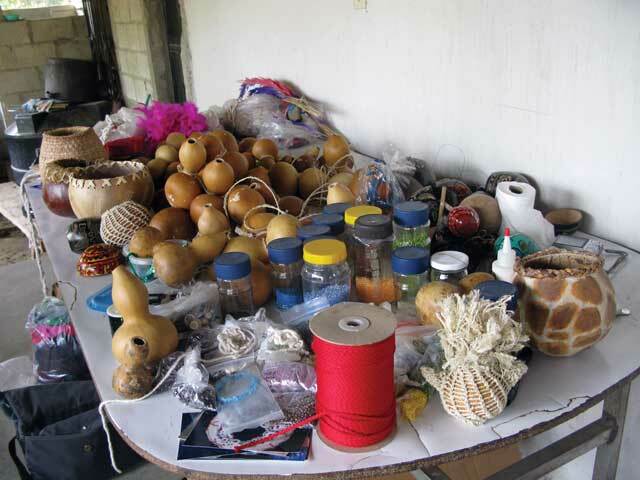 Thirty women learned looping techniques and worked with maguey fiber, beads, cordage, fabric and feathers. One young woman even used her own hair. The first day everyone created tecomate shaped dolls, with the exception of one, who made a chicken. Morros were turned into decorated bowls. The second day more animals emerged, and ideas and gourds got more colorful. The women worked hard and had fun. Now the task of growing morros and tecomates, plus exploring new forms and added materials is upon them. 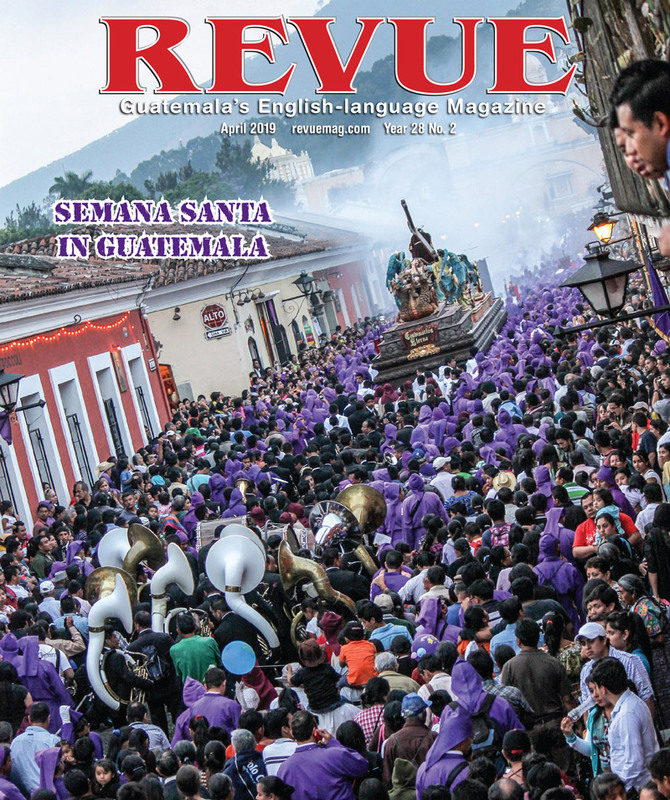 As with other traditional arts of Guatemala, the evolution into contemporary styles can provide new markets, and with these, increased income is possible. 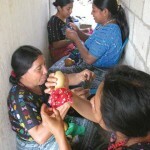 So, as the women from this small aldea look toward their future, help support them, and be on the lookout for unique gourd products in the marketplace, and the label Mayan Hands.